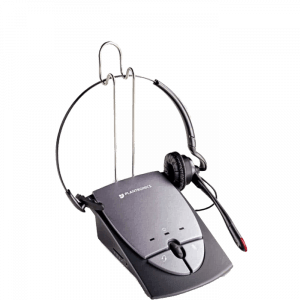 Corded Home Headsets - Headsets Direct, Inc. If you have a home office or simply want to have a more comfortable, hands-free call with friends and family, it’s time to invest in a headset for home. You will need to decide between a corded option, which will cost less and require almost no maintenance, and a wireless unit which gives you mobility as you talk, but requires charging and battery replacement. Below you will find a great selection of corded home headsets with multiple wearing styles and compatibility configurations. When considering home headsets, you will have two options for compatibility. The first is to purchase a headset telephone which will include a base that acts like a telephone. It will have a ringer, allow you to initiate calls with an on/off button, have a keypad for dialing, and optional features that may include; volume controls, redial, and microphone mute. The second option for wired home headsets will be an amplifier and headset which plugs into your existing corded phone. This allows you to use an existing phone, which may have multiple lines or special features you need or a phone that connects to your company’s phone system via a VoIP connection.